Located within a modern office block, these recently refurbished serviced offices offer first class accommodation. From the moment you enter the building through the large reception, to the striking offices and communal spaces, you will not be disappointed. The offices all have air conditioning, plenty of natural light, 24 hour access and high speed broadband as standard. There are three meeting & conference rooms available to hire when you need them with Wi-Fi and AV equipment provided, catering can be arranged depending on your requirements. Breakout areas and kitchen facilities are available and you are just a short walk from Oxford Street; Prefect for some lunchtime shopping or drinks after work. 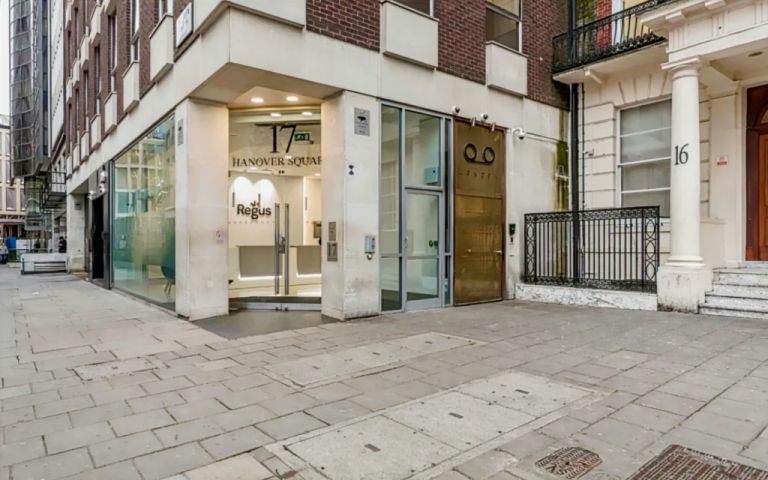 This fully serviced business centre situated in the heart of Mayfair. Hanover Square is a short walk from Regent Street and Oxford Street, in the Mayfair district. Oxford Circus is just a few minutes walk away as is Bond Street station. Between these two stations almost every area of London is within easy reach. Easy Offices Where is the nearest place to get lunch near Hanover Square? Easy Offices Where is the nearest car park to Hanover Square? Easy Offices Where is the nearest public gym to Hanover Square? Easy Offices Where is the nearest coffee shop to Hanover Square?